The waters of the Earth contain an astounding biodiversity, with scientists considering oceans to be some of the most diverse ecosystems in the world, rivaled only by rainforests. 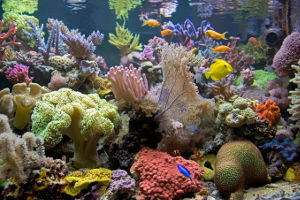 As a result, the variety of lifeforms there are to be seen in aquariums around the world is staggering—plants, coral, cephalopods, snails, crustaceans, urchins, starfish, and so much more. But in almost any aquarium, there’s one type of organism that’s always the bread and butter, the backbone of the display, and not least because they tend to be the only vertebrates. We’re talking, of course, about fish. If you have an aquarium, more likely than not you have fish in it. But how do you know that your aquarium maintenance routine is truly keeping your fish as healthy as they should be? What are all the parameters you should be monitoring, and what can you do to be proactive in keeping the fish in top shape? Here’s a rundown of the things you should be keeping track of to make sure that the fish in your aquarium don’t start looking green around the gills. When you're done, be sure to see our beginner's guide that offers a more complete overview of aquarium maintenance as well! There’s so much to be done to ensure the health of your aquarium’s fish that maybe the best way to start is by trying to break up your aquarium maintenance routines and organize them into a schedule that’s easy to keep track of. The most logical way to do this is to organize all of your aquarium maintenance tasks by the frequency with which they must be performed. Divide your maintenance tasks up into those which need to be performed daily, weekly, monthly, or only upon starting a new aquarium. The last of those is where we’ll start. When starting a new aquarium, the first thing you have to do is get a nitrogen cycle going. The nitrogen cycle is the process by which unhealthy elements in the water are broken down to help generate and nurture the growth of good bacteria that your aquarium inhabitants need to survive. The cycle consists of protein-rich fish food getting digested by fish and then expelled as waste rich in ammonia. The good nitrifying bacteria then convert this ammonia into nitrites and then nitrate, which builds up in your aquarium until it’s removed by regular water changes. To start this cycle you should first let your aquarium run for at least a day without fish. Then you seed the aquarium with bacteria using a cycling aid, and introduce a couple of your hardiest fish, such as danios or gouramis, adding no more than three per week. As long as you’re careful not to overcrowd or overfeed, ammonia levels should stay at safe, low levels, but you should frequently test the water and remove some if harmful elements are too high. When setting up your aquarium, you should also install an aquarium heater to keep the water temperatures in a stable range between 74 and 82 degrees Fahrenheit (23-28º C). Making sure that the water temperature stays stable should be your daily aquarium maintenance task. The other parameters of your water should be tested on a weekly basis. Some suppliers offer water testing services but it’s more convenient to invest in water testing kits and do it yourself. First of all, your aquarium’s pH levels should be kept stable. Rising pH increases the toxicity of chemicals like ammonia, and rapid changes in pH can be deadly. While there are products that advertise quick pH fixes, you should try to control pH with safer methods by controlling other factors in the water. In particular, the water’s pH levels are interconnected with water hardness and alkalinity. Low alkalinity can result in sharp pH shifts that can devastate your inhabitants’ health, and hard or soft water will increase and decrease the pH, respectively. Keeping water hardness at a moderate level of 100-250 mg/L and alkalinity in the range of 120-300 mg/L will help you keep stable pH levels. The specific pH you aim for depends on the fish you keep, but should generally stay somewhere between 6.5 and 8.2. Another parameter to test for is the concentration of chlorine and chloramine. These chemicals are added to municipal water supplies to make drinking water safe for humans, but they’re deadly to fish in any amount. Make sure all water added to the aquarium is put through a dechlorinator and test for these substances regularly to make sure they’re not present. The rest of the things you should be testing for relate to the nitrogen cycle. Testing for ammonia, nitrite, and nitrate is essential to maintaining the health of your fish. These substances should be kept at an absolute minimum. Proper filtration and regular water changes will take care of this—your weekly testing should include a water change, replacing 10% of the aquarium’s water with fresh dechlorinated water. In addition to that weekly water change, you should also once a month perform a 25% water change and/or gravel vacuum. This is also the time to scrub for algae and perform other maintenance specific to your aquarium, such as pruning live plants, cleaning plastic decorations, and replacing the air stone in your pump. Most importantly, you should be performing monthly maintenance to your filtration system. A complete filtration system should incorporate mechanical, biological, and chemical filtration in tandem to remove ammonia and nitrites as well as clean the water of debris. There are a variety of systems you can use, including undergravel filters, canister filters, and power filters. You should choose the one which suits your aquarium best so that it can adequately protect the health of your fish. You should maintain this system once a month by rinsing the pre-filter, replacing the carbon and filter cartridge, and performing the other maintenance specific to your filtration system type. There are all sorts of other proactive measure you can take if you feel that your fish need additional protection for their health. Controlling the water’s salinity to be closer to the internal salinity of the fish reduces their stress and help them better adapt to the aquarium environment. You should be careful to monitor the effect that salinity changes have on pH, but this could be a useful tactic. You might also provide the fish with dietary supplements or immune system stimulants to keep them from getting sick during the initial transition. Of course, there are plenty of other precautions and measures you can take to be proactive in making sure the waters of your aquarium are a hospitable environment for your fishes’ health. If you’d like to discuss how you can keep your fish healthy, or have any other questions about starting and maintaining a thriving aquarium, give Living Art Aquatics in Crystal Lake a call at (847) 737-5151. We have the expertise you need to help your aquarium flourish with healthy, vibrant fish.